Phase 1 of Pratt & Whitney's Geared Turbofan (GTF)'s flight testing has been completed. Over the course of 12 flights the engine, on a 747 testbed, amassed 43.5 hours in a number of altitudes "exploring the full flight regime". Phase 2 will take place next month on an Airbus A340-600 to continue tests and also to explore acoustic performance. 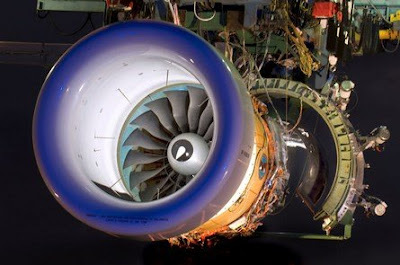 GTF engines are intended for the future Mitusbishi Regional Jet and Bombardier CSeries regional airliners. Airbus and Boeing have not, as yet, announced if they will use the GTF though if it indeed does offer 10%+ improved fuel burn compared to existing engines then it is only a matter of time.